We offer a vast range of hair styling chairs for ladies, so that theladies parlour owner also find a very vast variety for their parlour, so that their parlour looks goods and they will able to give a goodresult to their esteemed clients. - These Reclining Chairs are built with Beautify curved Back-Rest. - Designed with adjustable Head-Rest. 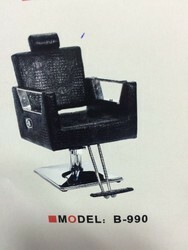 Being one of the renowned organizations in the industry, we are providing our clients with a unique range of Exclusive Revolving Salon Chair. We are one of the leading manufacturer of all kinds of salon and beauty chairs, equipment.